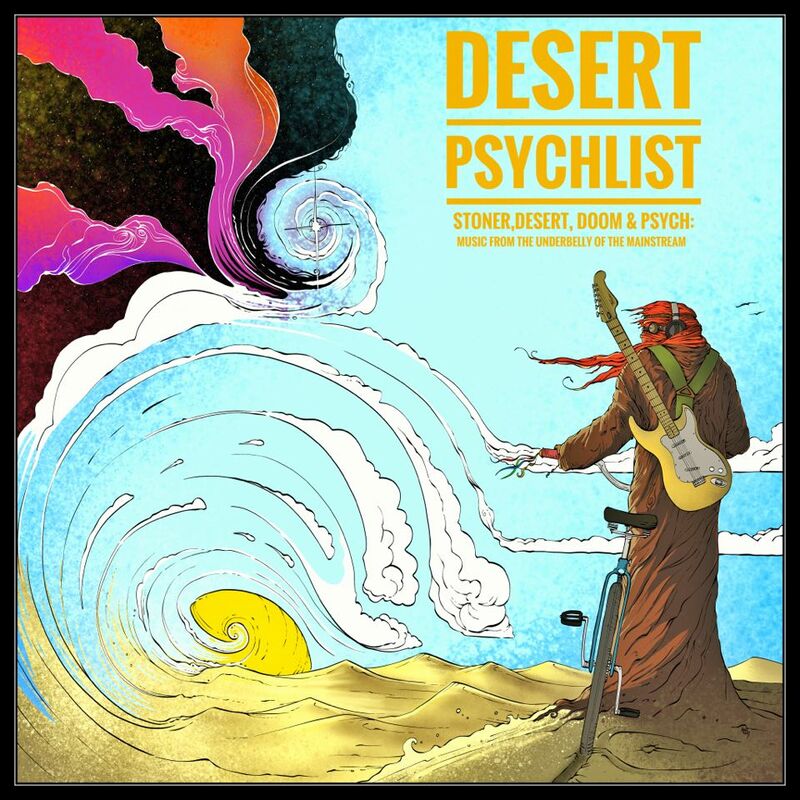 Well as plans go Desert Psychlist's seemed a good one, cease from any more reviews for the month and then just put out our "Best Of 2017" and take a well earned rest, but that plan was well and truly scuppered by a release that just screamed "review me" and so here we are again sitting in front of a PC, earphones on and fingers hovering over a keyboard. Beginning with the sounds of an Aboriginal instrument (digeridoo) backed by shards of dissonant chords and hand hit percussion ("The Signal") may not be the indicator you the listener are looking for when checking out something tagged as psychedelic stoner metal but it does point to the fact that Sons of Nibiru are not a band prepared to adhere to those rules set out by genre and expectation. "Arrival" follows a similar path to "The Signal" but this time moves into more electrified territory with Caspah moving back to his full kit and locking in with Khshemo's big growling bass, behind Quoda's exquisite guitar colourings, to drive an atmospheric instrumental that builds layer by layer, unwrapping little sonic delights as it grows. 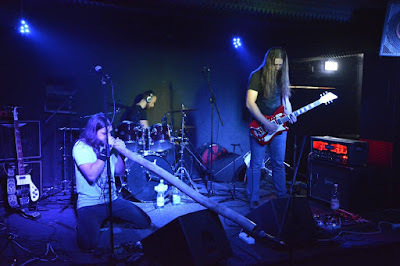 "Peachcraft" muddies up the waters by moving into a grumbling heavy stoner groove with Khshemo's bass the dominant force, his low, low bass rumbling like an earthquake ready to split the ground asunder and is superbly backed by Caspah's busy percussion and Quoda's soaring solo's and textured licks and fills. Vocals raise their heads for the first time here and are pitched slightly monotonic and Gregorian giving the song an almost monastic, spiritual feel. "Pulsar" follows and finds the band experimenting with every effect and trick in the book to create a stunning soundscape of spacial ambience. "Hellspirit" brings things back to Earth with a song that, for this reviewer, recalls the heavier "Barrel of a Gun" era of Depeche Mode but with Sons of Nibiru taking the song off on tangents that even the most drug addled Mode would baulk from travelling to. "The Journey" sees the band getting expansive and a little cinematic with Quoda leading from the front with some truly scorching lead work ably supported by Khshemo's ever present grizzly bass and Caspah's sympathetic rhythms. 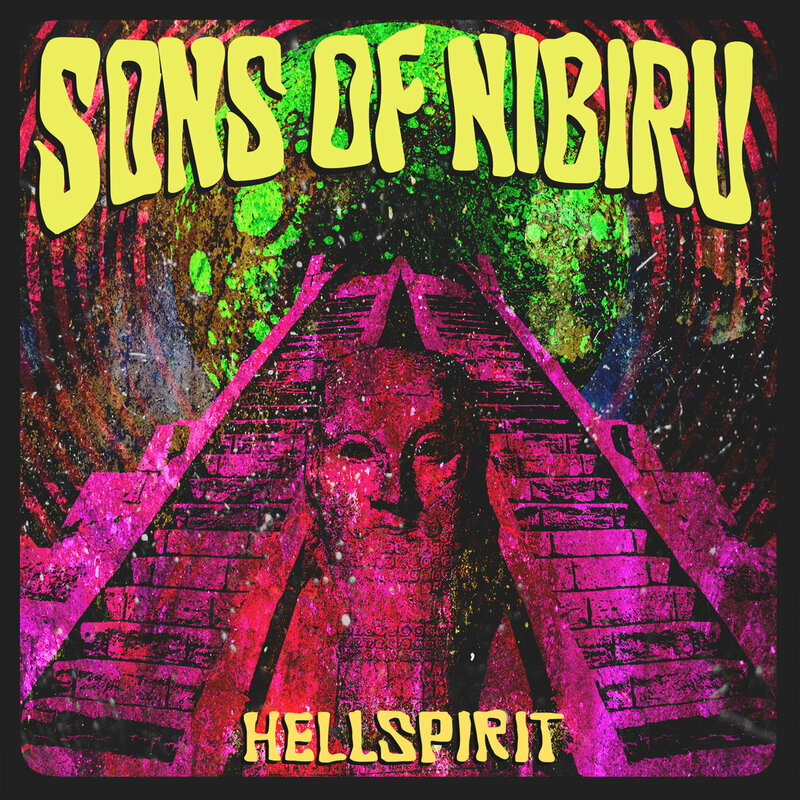 Sons of Nibiru finish things in grand style with their final song "Star Sailors" an epic tome that pulls all those threads explored in the albums previous songs and weaves them into one massive and awe inspiring musical tapestry. "Hellspirit" is a stunning album that defies all the usual tags and labels we tend to lump music into thanks to its diverse nature and also thanks to the bravery of a band not prepared to compromise their musical vision and ideals.